Social media is one of the best methods of promoting your brand and interacting with others, but it won’t help if no one knows that you have it. 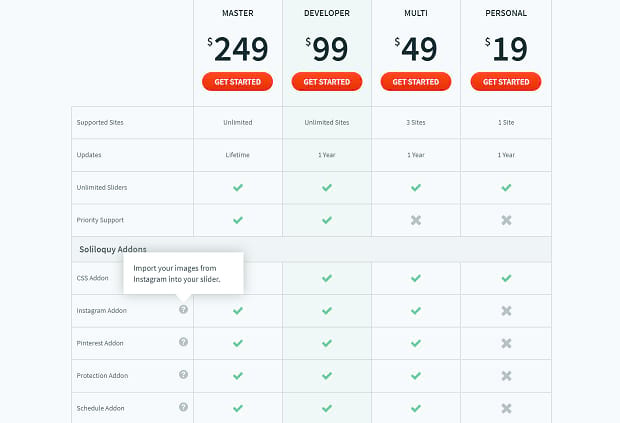 A social media slider is one approach to informing visitors about your connections. Sliders are scrolling feeds, text, or images you can place anywhere you want. 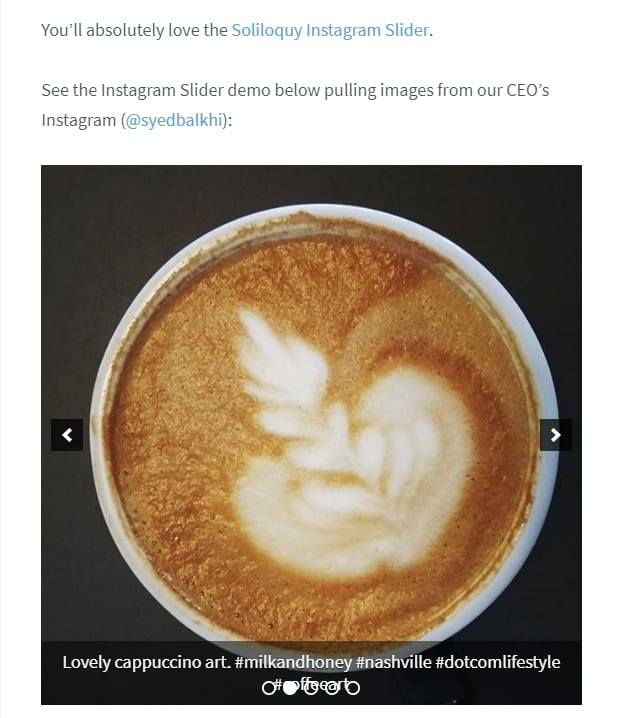 You can either display your Instagram posts, or link directly to other social media sites. Both can increase publicity to your other profiles and further interaction with old and new visitors. WordPress doesn’t have slider functionality by default, so you’ll need to use a plugin like Soliloquy to create a social media slider. Start by installing and activating Soliloquy. After purchasing it, log into your account and download the plugin. Then head over to your WordPress dashboard. Then go to Plugins and install it by uploading the file under Add New. Once you’ve verified your license key, it’s time to add your social media sliders! If you want something more animated and interesting than share buttons, a slider can draw attention. Put it in a sidebar or at the bottom of the page, and you’ll have an elegant way to direct visitors to your Facebook, Twitter, Instagram, or more. Start by creating a slider. Find the Soliloquy menu in your WordPress admin panel, then click Add New”. From here, customize attributes like title and upload the images you want to use. How you create these images is up to you, but make one for each social media you want to link to, and include a strong call to action. Most social media companies will let you use their logos, so visitors know at a glance where this image will take them. Once you have your images, edit your slider and go to the “Slides” tab, where you’ll find a pencil in the corner of each image. Click one, and enter your social media’s URL into the proper box. Rinse and repeat. It’s as simple as that! You can also change the size of your slider, so you could have a tiny box of icons that takes up barely any space, or a huge, eye-grabbing gallery linking out to other sites. Just edit your slider, go to the “Config” tab, and change the dimensions to whatever you want. 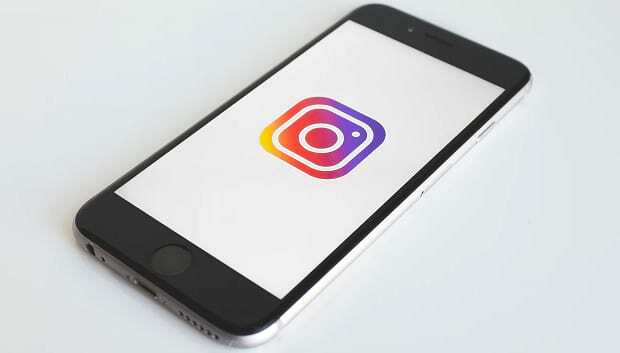 You can increase traffic to your Instagram account with a slider that shows your latest posts. Adding your account is easy, so you can start pulling from your feed with just a few clicks. Just remember, for Instagram or Pinterest, you’ll need the Multi or higher plan. If you have the Personal plan, you’ll have to upgrade — or update your slider manually instead. And that’s just inefficient. To create an Instagram slider, begin creating one as normal and select the “External Slider” tab. Then authorize your account, and you’re done! Add it to a page and forget it exists; all your latest Instagram posts will now show up there. If you want to display WooCommerce products, you can use a similar method as well. Every brand should have a social media account, whether you’re part of a big company or a single freelancer. Through sites like Facebook and Twitter, you can draw in new customers, promote sharing, and communicate with your followers. Displaying connected profiles on your website is a great way to direct people there. A strong social presence means a strong brand, so make sure everyone knows about your accounts by promoting them with a social slider. Do you make use of social media sliders? We’d love to hear about your use cases. And feel free to follow us on Facebook and Twitter for more tips every day.